Don't miss out. There's only 4 available and 13 other people have this in their cart right now. Don't miss out. There's only 1 available, and 13 other people have this in their cart right now. Cupcake Mold....The finished piece will measure 25mm tall and 24mm in diameter. For reference….25mm is one inch. FOOD SAFE: We offer all of our molds in food grade silicone. At checkout you will see a drop down menu asking you to choose the mold type. Just select food safe and I’ll take it from there. If food grade silicone is selected this normally takes me an extra 48 hours to assure the silicone has cured properly before shipping. 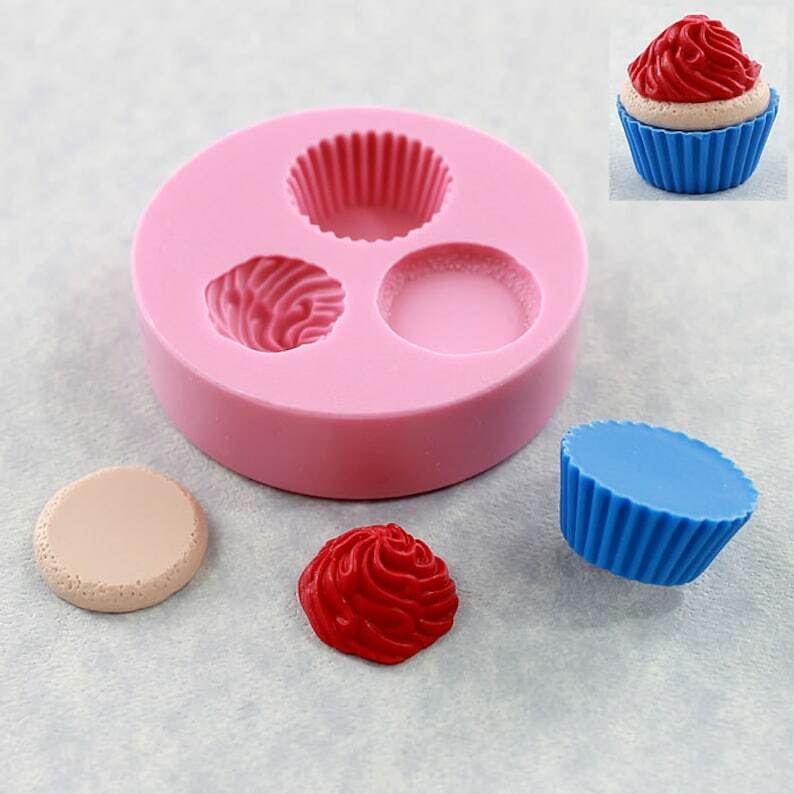 You can use our food grade silicone molds for chocolate, fondant, sugar, candy, butter, gumpaste, isomalt or any other edible that requires temperatures below 395 degrees Fahrenheit. On some the more intricate molds you may wish to put the filled mold in the freezer for a few minutes to avoid distortion when de-molding. GENERAL PURPOSE: Our molds are flexible with no need for a releasing agent; your finished piece will just pop out of the mold like magic. Our general purpose silicone rubber is great for a variety of materials to include wax, soap, gypsum/plaster, epoxy, PMC, all types of resin, polymer clay, paper and probably anything else you can think of. The mold can be put in the oven to accommodate all your needs; just don’t go over 395 degrees Fahrenheit. Some of our molds are quite intricate; not necessary, but if you prefer, you can bake your clay right in the mold without concerns of clay distortion when de-molding. INFO: All of our molds are lovingly handmade by hubby and me and we inspect each mold before shipping to limit clean up on your end. We pour all of our molds rather then pressing them to pick up the most intricate details and to allow for a smooth flat back. We guarantee you will receive professional quality molds. Handcrafting professional quality molds for over 20 years and counting. All images, content and products are copyrighted by MoldMuse. MoldMuse reserves all copyright protections under applicable law. All images, content and products are copyrighted by MoldMuse. MoldMuse reserves all copyright protections under applicable law. Truly professional grade products. I have bought multiple times from this store now and love the quick shipping and materials used to make the mold. Very highly recommend this store. For all US orders we gladly accept Paypal. Returns: For obvious reasons we don’t accept returns. However, if there is something defective with the mold you received just shoot us a picture or return it and we will gladly send you out a replacement mold. For my U.S. customers…I ship First Class parcel and use delivery confirmation on all my shipments in the U.S. so you can track their journey and know when to expect your goodies. Please check to make sure the address is correct. For my international customers…We ship first class which can take 2-4 weeks for delivery. Also understand that you are responsible for any customs or import fees charged by your country.